The French have a remarkable tendency of creating free-flowing, poetic movies that transport this art form into subtle, poignant flights of fancy and nowhere is this more evident than in Jules et Jim, which embodies the beauty of French cinema. "Jules et Jim," Francois Truffaut's masterpiece of 1961, is a memorably touching tale of a romantic triangle, played to perfection by Jeanne Moreau, Oskar Werner and Henri Serre. Truffaut is one of the most poetic filmmakers in cinematic history and Jules et Jim is his finest moment. Truffaut considered "Jules et Jim" a "hymn to life," and it is most memorable as a vivid celebration of friendship and youthful possibility, even as it acknowledges how those things can sour. Although "Jules et Jim" was made over 50 years ago and takes place 40 to 50 years before that, the amazing thing is that it barely seems to have dated as it focuses on the universal human relationships between its characters, rather than the specific time in which they live. Truffaut's New Wave techniques lend a remarkable energy and freshness to the film. In 1912, in Paris, the French bon-vivant Jim meets the insecure German Jules and they begin a great friendship. Jules and Jim are young artists who enjoy a peaceful friendship–until they meet Catherine, the epitome of la femme fatale. She is the catalyst, the troublemaker, the source of despair as well as joy; an enchantress, she is also a fanatic and a fatalist. Determined to live as fully as a man, she claims equality while using every feminine wile to increase her power position. Both Jim and Jules immediately fall in love with the fickle and independent Catherine . However the naiveté and fragility of Jules attracts the amoral Catherine and she marries him. With the First World War, the best friends Jules and Jim are separated, but after the war they reunite in Jules's cottage in Germany. Jim stays with Jules, Catherine and their daughter Sabine, and Jules tells his friend that while he has lived with Catherine she has had affairs with several lovers. When Catherine falls in love with Jim, Jules asks him to stay with her at his house. Along the years, Jules and Jim live a triangle of love with Catherine, but never affecting their friendship and respect. 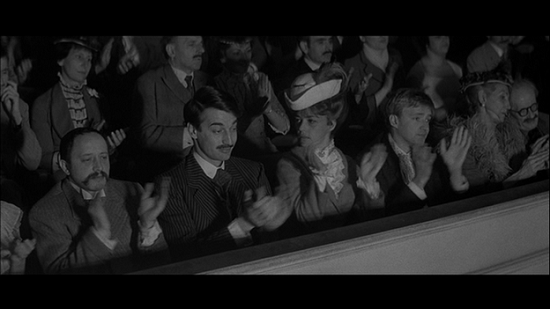 Though titled "Jules et Jim", the true focus of the movie is not on Jim or Jules, but on Catherine. Catherine fascinates all of them because she is immediate. "Catherine only revealed things she wanted when she had them in her hand", the narrator tells us. Jim tells her, "I understand you, Catherine". She replies quickly, "I don't want to be understood". The aesthetic tension of the film is not, as one might suppose, between Jules and Jim but rather between their passive, observant natures and her active will and concrete sympathies of Catherine. Catherine doesn't like people being away from her, Jules explains to Jim. "When she has the slightest doubt she always goes much farther than the other person." If Catherine were simply a "blithe spirit" attracting and capturing the literary drudges, the film would be a grand cliché. But Jules et Jim is not such a simple portrait of Catherine; it is rather an essay on the space between her and her lovers. We share Jim's perspective; he "could only admire Catherine unreservedly by herself; in company, she became something relative." When the two friends meet Catherine and observe her Chariot act, the narrator carefully explains that "Jules et Jim" was moved, as if by a symbol they did not understand". Catherine never escapes from the burden of symbol-hood. The dramatic tension of the film results from the imbalance between Jules' and Jim's image of Catherine and whatever existential reality she might have had. The poignant ending could have been drawn out yet Truffaut makes it short but sweet. Elliptical, witty and radiant, Jules et Jim is one of the best French movies ever made and certainly a highlight of the New Wave. Truffaut doesn't linger–nothing is held too long, nothing is overstated. Catherine is probably the screen role that Jeanne Moreau is most intimately associated with.